Exo Terra Aquatic Turtle Hatchling food is a nutritious micro-pellet diet made with Gammarus shrimp and fortified with vitamins and minerals. 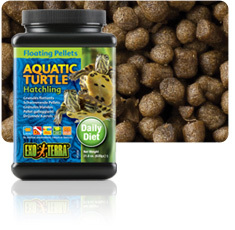 Exo Terra Aquatic Turtle Hatchling food provides all hatchling aquatic and semi-aquatic turtles with a rich source of nutrients including vitamins, calcium (multiple sources), quality protein and more. This high quality extruded floating pellet helps turtles to develop a hard shell due to both the natural and supplemented sources of calcium. Vitamin D3 is included and essential in ensuring proper absorption of calcium. These extremely palatable floating micro-pellets deliver quality nutrition. Exo Terra Aquatic Turtle Hatchling food includes “Advanced Yeast Extract” to help support a healthy digestive system. Ingredients: Fish meal, soluble fish protein concentrate, glycerin, wheat flour, potato meal, wheat gluten meal, rice hull, shrimp meal, fish oil (preserved with ethoxyquin), squid liver meal, dicalcium phosphate, spirulina algae meal, lecithin, choline chloride, DL-methionine, yeast extract, fructooligosaccharide, ferrous carbonate, calcium L-ascorbyl-2-monophosphate, zinc oxide, manganous oxide, vitamin E supplement, niacin, beta-carotene, cupric sulfate, d-calcium pantothenate, riboflavin, thiamin mononitrate, pyridoxine hydrochloride, folic acid, menadione sodium bisulfite complex (source of vitamin K activity), calcium iodate, cobalt carbonate, sodium selenite, biotin, vitamin B12 supplement, vitamin A acetate, vitamin D3 supplement. Guaranteed Analysis: Crude Protein (min): 43.0 %, Crude Fat (min): 10.0 %, Crude Fiber (max): 1.0 %, Moisture (max): 13.0 %, Calcium (min): 2.0 %, Calcium (max): 2.4 %, Phosphorus (min): 1.0 %, Vitamin A (min): 20 IU/kg, Vitamin D3 (min): 10 IU/kg. Feeding Guide: Feed as much as the turtles can eat in five minutes, two times daily. Remove any uneaten food with a net after one hour. Offer your turtles Exo Terra canned Shrimp or Fish as a turtle treat for more variety.Tip: Use Exo Terra Biotize to help maintain an optimal aquatic turtle environment.